Our faculty are at the cutting edge over the full range of these disciplines. Our physicists fill in major gaps in our fundamental understanding of matter, participating in the recent Higgs boson discovery, and demonstrating the first-ever teleportation of information between atoms. Our astronomers probe the origin of the universe with one of the world's premier radio observatories, and have just discovered water on the moon. Our computer scientists are developing the principles for guaranteed security and privacy in information systems. cross-disciplinary educational experience that is also affordable. Strongly committed to making science and mathematics studies available to all, CMNS actively encourages and supports the recruitment and retention of women and minorities. Our students have the unique opportunity to work closely with first-class faculty in state-of-the-art labs both on and off campus, conducting real-world, high-impact research on some of the most exciting problems of modern science. 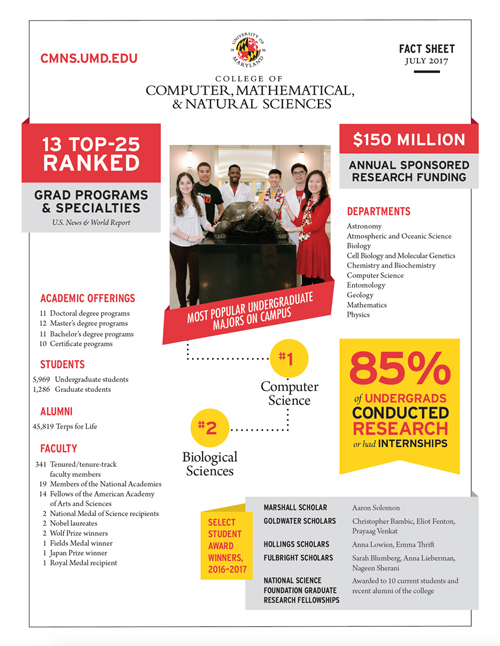 87% of our undergraduates conduct research and/or hold internships while earning their bachelor's degree. CMNS degrees command respect around the world, and open doors to a wide variety of rewarding career options. 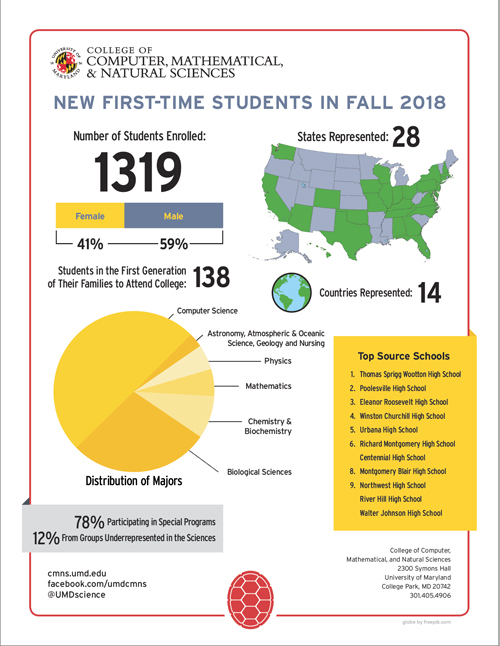 Many students continue on to graduate school; others find challenging positions in high-tech industry or federal laboratories, and some join professions such as medicine, teaching, and law.